The Nuclear Advanced Manufacturing Research Centre and US-based reactor developer NuScale have signed a new agreement to work together on the development of a groundbreaking small modular reactor. 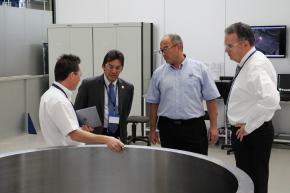 NuScale chief technology officer Dr Jose Reyes and executive vice president Tom Mundy visited the Nuclear AMRC on 19 November to see how the centre’s world-leading manufacturing R&D capabilities could help develop the company’s innovative reactor and reduce costs in production. 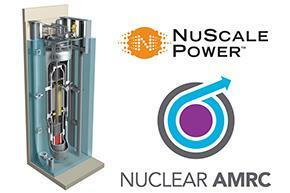 NuScale’s Power Module is a 50MWe pressurised water reactor and generator, designed to be deployed in clusters of up to 12 per site. The combined containment vessel and reactor system measures around 25 metres in length by five metres diameter, small enough to be transported by a single lorry, and features state-of-the-art passive safety systems which significantly reduce risks associated with current reactor designs. 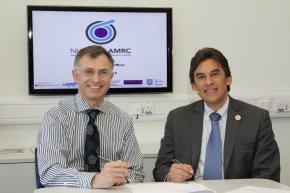 The new agreement signed by Dr Reyes and Nuclear AMRC chief executive Mike Tynan opens the way for potential collaboration on the development and manufacture of the NuScale technology. 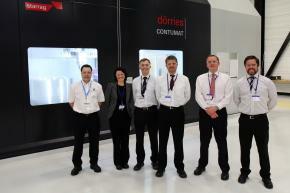 During their tour of the Nuclear AMRC’s research factory, the NuScale team found out about the centre’s research and capabilities in areas such as electron beam welding, diode laser cladding and very large high-precision machining. NuScale’s visit to the Nuclear AMRC was part of a week-long programme of engagements with key UK nuclear engineering facilities. 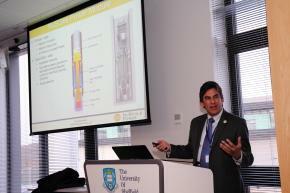 During his visit, Dr Reyes led a seminar on the NuScale design for an audience of local manufacturers and engineers at the AMRC Knowledge Transfer Centre . Dr Reyes also announced details of the new internship programme with the University of Sheffield, which will allow up to five Sheffield students to spend a summer at the company’s operational facilities in Corvallis, Oregon, and at Oregon State University. The programme will begin in summer 2015. The Nuclear AMRC has also signed a new agreement with engineering consultancy Atkins on nuclear industry R&D and supply chain support, which will potentially include collaboration on SMR development projects. The Nuclear Advanced Manufacturing Research Centre and leading engineering consultancy Atkins have signed a memorandum of understanding (MOU) to work together on nuclear industry research & development and on support and training for the UK’s civil nuclear supply chain. The MOU was signed by Mike Tynan, chief executive of the Nuclear AMRC, and Chris Ball, managing director for nuclear at Atkins. It confirms that the two organisations will work together for mutual benefit in areas relating to nuclear research & development, UK civil nuclear supply chain development, and the provision of effective support to the UK civil nuclear industry. Both groups will contribute expertise, experience and knowhow to their shared aims. Atkins commits to being an active supporter of the Nuclear AMRC, including joint reviews of opportunities for UK suppliers in nuclear new build, decommissioning and operations, and will seek to identify opportunities for the Nuclear AMRC to add value to Atkins’ delivery of commercial work. The Nuclear AMRC will involve Atkins in key areas of its manufacturing R&D including small modular and micro reactors, fuel cycle and waste treatment/management activities. 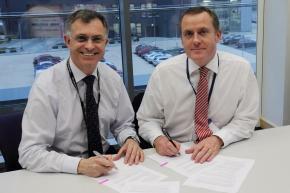 The Nuclear AMRC has also signed a new collaborative agreement with small modular reactor developer NuScale. UK nuclear generation – part of the Strategic Supply Chain Partnership for EDF Energy’s Nuclear Generation business providing additional expert engineering support as the company seeks to extend the life of its existing nuclear AGR fleet. UK new nuclear programme – working collaboratively with Horizon Nuclear Power providing engineering and related technical services for a new generation of nuclear power stations at Wylfa Newydd on Anglesey and Oldbury in Gloucestershire. Nuclear decommissioning – currently preferred bidder on a new contract with Sellafield Ltd for its Silos Direct-encapsulation Plant (SDP) project in the UK, as part of an equal three-way joint venture with Areva and Mace (a.m.a.). UAE’s peaceful nuclear new build programme – providing technical assurance to lenders backing the United Arab Emirates’ most ambitious energy infrastructure projects. For 13 years, the Nuclear Industry Association’? ?s Energy Choices conference has showcased the valuable contribution nuclear power provides to the UK. From new build and power generation to decommissioning and safe storage, the nuclear life cycle provides a wide variety of jobs, a reliable source of energy and a dependable stream of work for businesses small and large, benefitting the UK economy as a whole. Following on from the successes of Energy Choices the NIA is rebranding the conference in 2014. #Nuclear will see speakers and panellists from across industry, government and beyond, presenting updates from civil nuclear alongside in-depth discussions of developments throughout the year. 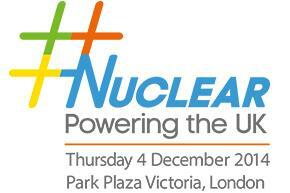 For more information, visit #Nuclear at the NIA website. Wednesday 19 November, AMRC Knowledge Transfer Centre. The Nuclear AMRC hosts an afternoon seminar with NuScale Power, focusing on the challenges and opportunities of small modular reactors (SMRs). SMRs are a potential next stage in the evolution of reactor technology. According to speakers at a recent Nuclear Institute conference, SMRs offer the UK the opportunity to take a global lead in reactor technology and nuclear manufacturing – for more information, download our latest newsletter (pdf). Because SMRs are designed to be largely built in a factory, their development and economic viability will depend on the capabilities of manufacturers along the supply chain. NuScale is one of the most advanced SMR developers, and we are delighted to welcome the company’s chief technology officer, Dr Jose Reyes, to the Nuclear AMRC to discuss its design and plans. Dr Reyes will provide an insightful look at the technology behind the NuScale Power Module design, and discuss the challenges and potential benefits of SMR development. There will also be an audience Q&A and networking opportunities.